Thousands of years old stone pyramids lay intact deep in the jungle of Indio Maíz, southwestern Nicaragua. Some call it a lost city of ancient Indians, but little is known about the history of these structures. The site, called Canta Gallo, is sacred to Rama people, descendants of the Chibcha Indians. 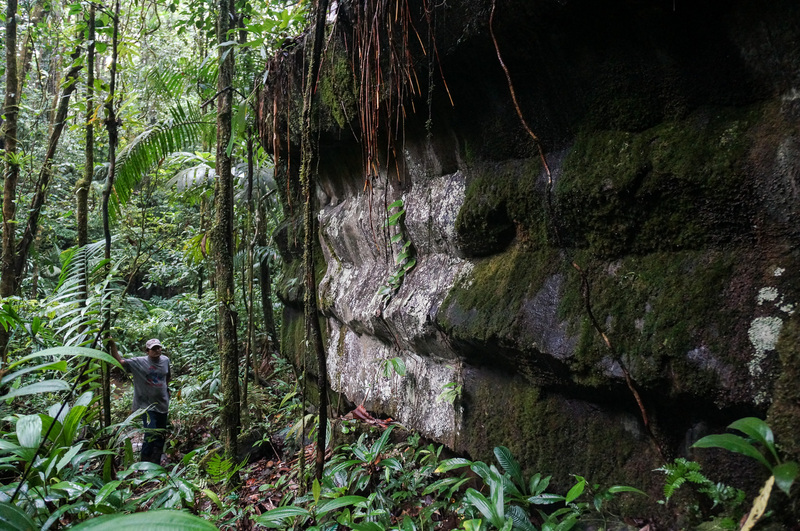 “This is where our ancestors used to meet”, our guide Margarito says and points at a giant stair-like stone pyramid amid ground vegetation. He sits calmly on the stairs to tell us some incredible stories with his broken Creole English, mixing in words of Spanish like the Rama Indians do. 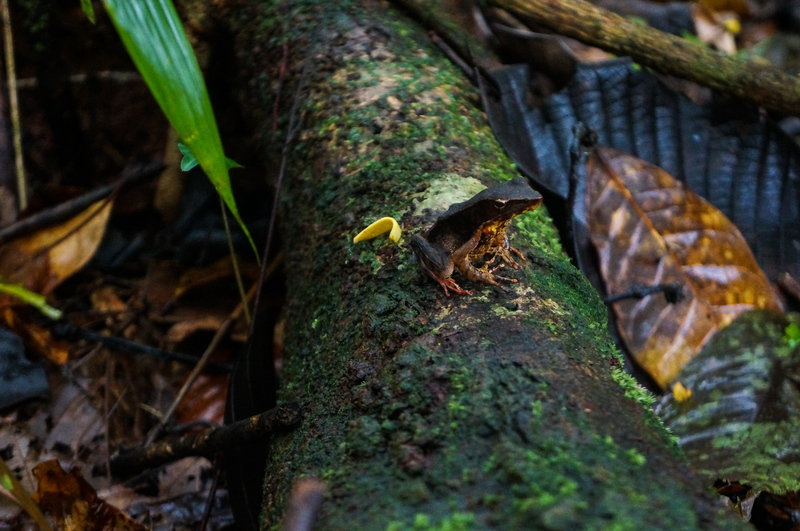 We had traveled eight hours in a small fiberglass boat from already remote San Juan de Nicaragua, overnighted deep in the jungle with chickens and bats, and trampled one hour through thick vegetation to get to Canta Gallo. I didn’t know what to expect, when Salomon, a Rama Indian, who initially brought us down the Rio Indío, asked in the morning if we would like to see the pyramids of Canta Gallo. For sure I wasn’t expecting this. After trudging past a few smaller, turtle-like stone structures and those stairs, we finally arrived in the main area of Canta Gallo, where we spent an hour or so zigzagging midst the ancient Indian pyramids and walls. Rays of the early morning sun cast an air of magic over gigantic rock formations. 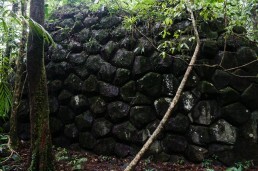 Bluish gray stone slabs are piled up to form huge stone balls and pyramids that might be over 20 meters in height. 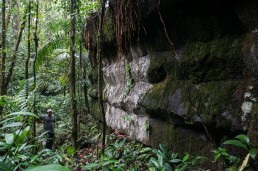 The Rama told us that these structures are known to date back from 3000 to 5000 years. 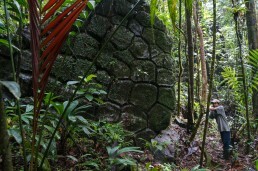 Suddenly I hear Salomon talking and pointing a stone structure with a puzzling look: “Here seems to be a fish”. Stone faces have ancient inscriptions, but even the Rama Indians can only guess their meaning. 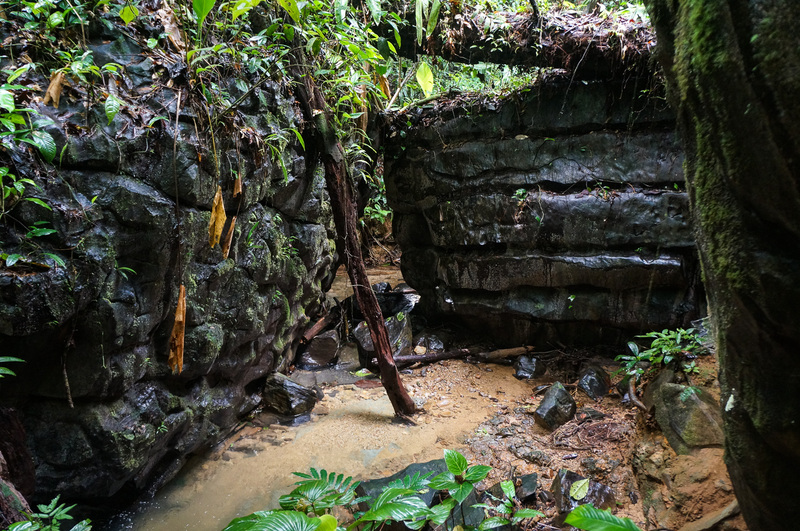 The pyramids of Canta Gallo are currently researched by the University of Bluefields, but there aren’t any written information available yet. I lost the count while we wandered around awestruck, we must have passed more than ten massive pyramids and some smaller structures. Our guide Margarito kept asking if we would like to see a few more – how could we have declined even though we were already dehydrated, and thus at the edge of our strength. 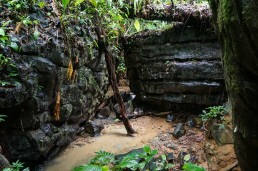 Passing a small river and a waterfall to reach the main pyramid was among the highlights for us. 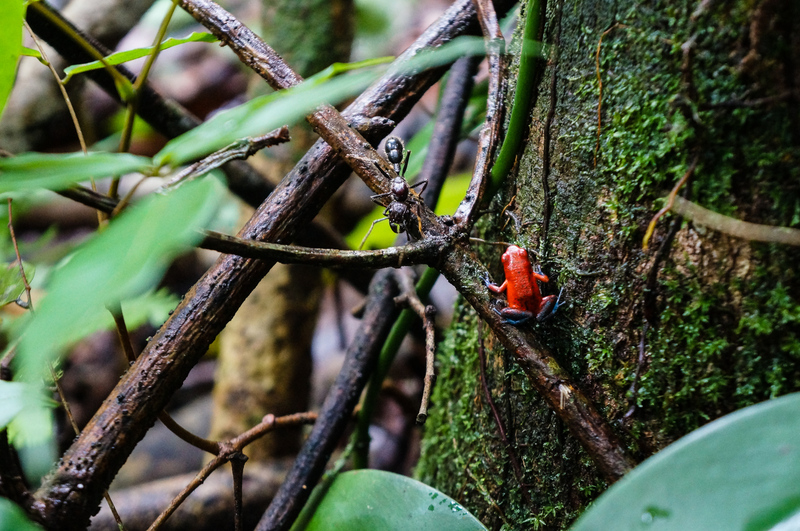 The moment felt so special: no other people had visited the site for days, exotic birds were chirping, and nail-sized colorful, poisonous frogs jumping around us. Even the mid-day sun blessed us, which is a rare treat in Indio Maíz. Stories poured in as soon as we stepped into the jungle from our tiny boat. Legends start with the name: the place is called Canta Gallo according to a rooster (gallo), which is said to appear screaming (canta) at this godforsaken spot once a year – nobody knows how it’s even possible. According to the Rama Indians, Canta Gallo is where their ancestors practiced religious rituals and gathered to deal with community issues. The site has served as a haven, where the Rama have escaped foreign conquerors. Canta Gallo where they hid from Spaniards 500 years ago, and later Miskitos, British, and Sandinistas respectively. Little is known about the ancient rituals – and little is told if someone has the knowledge. Canta Gallo is well off the beaten track. You’d need to travel deep into the Indio Maíz Biological Reserve, so you’d need a guide with a boat. It takes one day to get there, and the second to tour the ruins. Our boat trip from San Juan de Nicaragua lasted 8 hours, following the Indian River, Rio Indio, all the to the Canta Gallo. 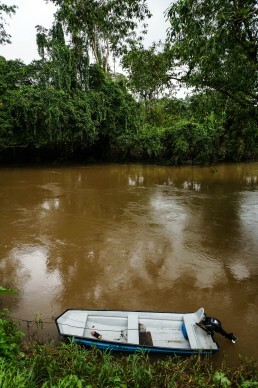 As there are slightly faster boats available (just prepare to pay more for your gasoline and boat rent), the Ramas are hoping that in the future visitors could see the pyramids on a day trip from San Juan de Nicaragua. If you were daytripping, the tour would still take at least 11 hours – assuming that river conditions are favorable, and you don’t take any breaks. I recommend spending the night at a local Indian home near Canta Gallo, both for your convenience and the experience itself. If you embark on the Indio Maíz trip with a Rama Indian guide as we did, he’ll hire another Rama to take you to the ruins. At the moment, the Rama use three locals, who know the route best. Our guide Margarito also takes overnighting guests in his house, which lies approximately 15 minutes by boat from where the path starts. We stayed at his neighbor Javier’s house, on the bank of Rio Indio. If you are planning to visit Indio Maíz and Canta Gallo, check out our recent article on how to organise a trip to Indio Maíz for further details. 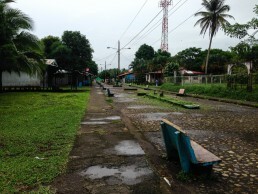 Check out our ultimate 4-week Nicaraguan itinerary for tips where to continue from Indio Maíz! You can also easily modify 1-6-week itinerary from our picks. When Salomon asked if three hours’ jungle trek might be too much for us, we laughed at him thinking this old Indian might be the weaker one of the bunch. However, the hike to Canta Gallo proved to be pretty challenging and extremely muddy, although it wasn’t even rainy season yet. Prepare with lots of water – we had only half liter per each, which was ridiculously little. 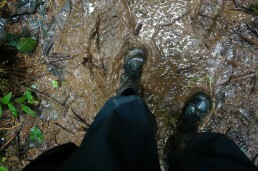 The first kilometer was filled with mud, as we hiked through a swamp. 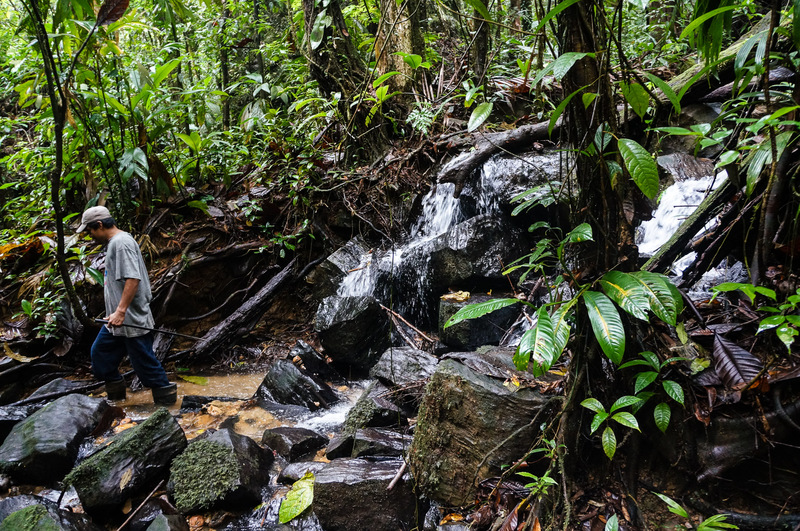 With United Nation’s financial help Ramas had built a few bridges over the wettest parts, which made the trip a lot easier. Still, we had to plow through smaller rivers. Piritta’s rubber boots were leaking, but I was happy, though clumsy, in my five sizes too big boots. Don’t even try it in sneakers, use the rubber boots Ramas offer. 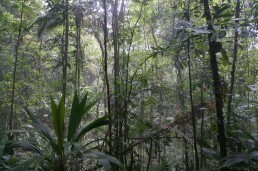 After a wet start, we climbed for almost an hour through the dense jungle. At first, there was a visible path, which soon disappeared. 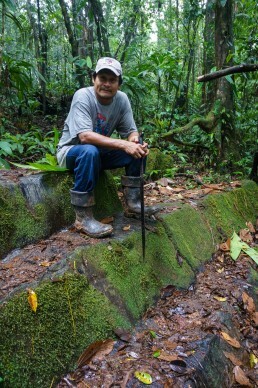 Margarito opened the way with his mighty machete, hitting blazes in the trees for the next hikers. It would have been impossible to find the ruins without a guide. 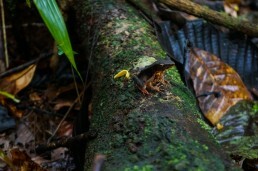 A plethora of poisonous frogs came in all sizes and birds had names I’ve never heard. 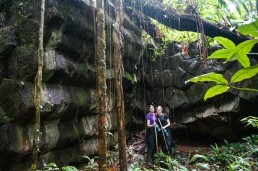 Tree trunks and even roots were enormous, bushes and vines clutched our feet. 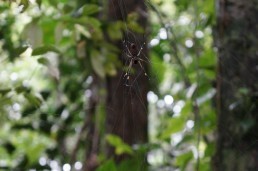 I tried to evade spider webs or, at least, the poisonous arachnids, which were plenty. Capuchins, howler monkeys, and spider monkeys warned other creatures as we approached. We ascended about 600 meters above sea level while the Rio Indio is a few meters. Hillside was wrapped in a weird, gray haze. It wasn’t the usual fog cloud forests have, and even the Rama Indians call it “smoke”, which made me ask of its origin. Salomon told that every tree produces a gallon of oxygen in a day. Multinational companies have expressed their interest in the area, but the Rama are not willing to sell land. These guardians of the forest want to figure out why and how this process is different here, and if it could be simulated somehow to help the planet. The Rama had built a basic hut on the top of the Canta Gallo hill, where we steadied our breath for a few minutes before a short, but quite steep descend to the ruins. When Salomon told us about their hopes of building a causeway over the swamp and expanding this hut into accommodation for visiting tourists, I felt a bit downhearted. I really hope the Rama will get the proper appreciation as a nation, and I know it requires publicity for their heritage, in the form of both tourists and the UN. These construction projects will make this place more accessible, and thus more visible. I’m just a bit concerned that the magical Canta Gallo might lose its authenticity. If you got interested, please go there before everyone else will. Whereas Canta Gallo has had a special meaning to the Ramas for centuries, officially it’s a new find. Canta Gallo hit the news less than ten years ago, when a foreign photographer claimed to find these pre-Colombian Indian pyramids. It was said that they were kept as a military secret. By then government declared that the pyramids were just volcanic lava outcrop. Stories conflict, as some of them place the discovery to 1998. However, Canta Gallo hasn’t been common knowledge for long, and its birth is still neglected. 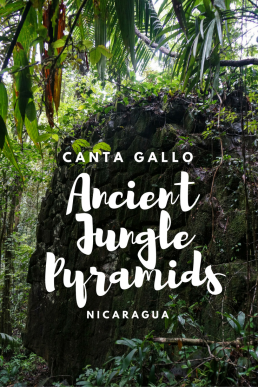 Honestly, I don’t know what’s the official truth at the time of writing, but I’m hoping that the Canta Gallo pyramids will get the position in Nicaraguan history they deserve. When some people in San Juan de Nicaragua – even the Rama Indians – told us that the Canta Gallo pyramids were made by volcanic lava cast, it sounded weird to me. The way people expressed it felt like an insult to the historical heritage of the place. After some research on columnar basalt, I may have to accept, although willy-nilly, the scientific explanation of the birth of these stone benches. Yeah, it spoils some magic. But does it have to? Even if these eerily man-made looking pyramids are formed by a special kind of volcanic lava cooling process millions of years ago, it makes them a stunning geological wonder. Geologists claim that these basaltic columns date back to the Tertiary period, which extends from 66 million to 2,58 million years ago. From cultural-historical viewpoint, the thing that matters is how ancient Indians used these structures. Basaltic columns have carvings, but could archeologists define their age and meaning? Are there any other clues, which would give us more information about these mysterious structures? Whatever the history might be, the site itself is beyond words and it’s sacred to the Ramas. In my opinion, our hike to Canta Gallo bet our visits in Machu Picchu and Angkor Wat, because the grounds are so immaculate. There are said to be 22 archeological sites in the Indio Maíz area. Canta Gallo left me longing for more. I’ve heard astonishing stories about the ruins further up the river, where a lake and a tree might just disappear. Sounds like a fairytale, but after visiting these captivating grounds, I wouldn’t be surprised to find some real magic deeper in the jungle. Some places are so sacred that the Rama Indians won’t take tourists there. There are stories about unlucky army officers, who’ve tried to venture into the Rama territory with bad intentions and met their fate at the hands of the jungle guarding spirits. I’m more than eager to hear if you’ve visited Canta Gallo pyramids or Indio Maíz: what did you find? 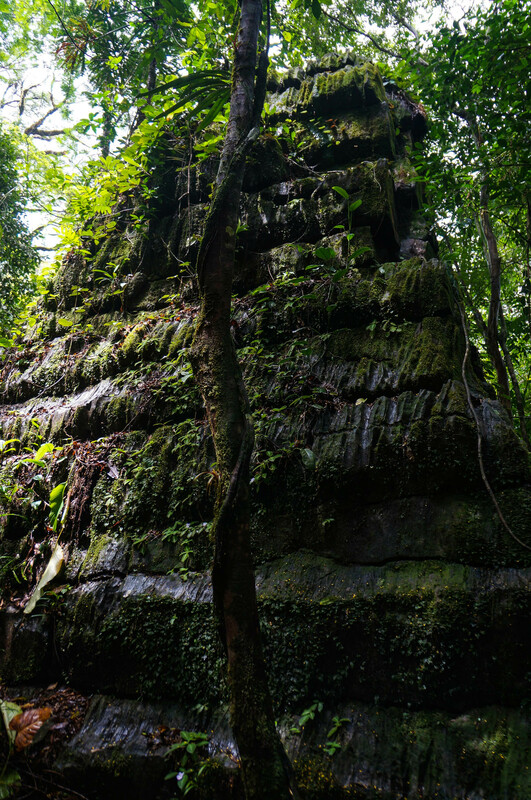 Venture deep into Indio Maíz jungle with Rama Indians, stay in the traditional Rama home, and hike to the sacred pyramids of Canta Gallo. Meeting the indigenous people of Nicaragua, the "Guardians of the Forest" – the Rama. This remote town with concrete pathways, three different names and four old, little graveyards is a great gateway to Reserva Biológica Indio-Maíz, the best jungle of Central America. 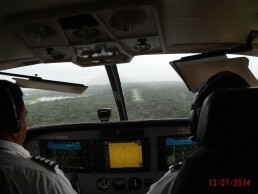 In 1998 the Nicaraguan Army flew me into that place to evaluate a lost city. After about one minute I concluded that it was columnar basalt, not built by humans. Then General of the Army Joaquin Cuadra was as mad as anyone I have ever seen when he was embarrassed by this humbug discovery and he was not pleased with Pedro Joaquin Chamorro, who was the Minister of Tourism at the time and maybe saw tourism potential, not archaeological veracity. 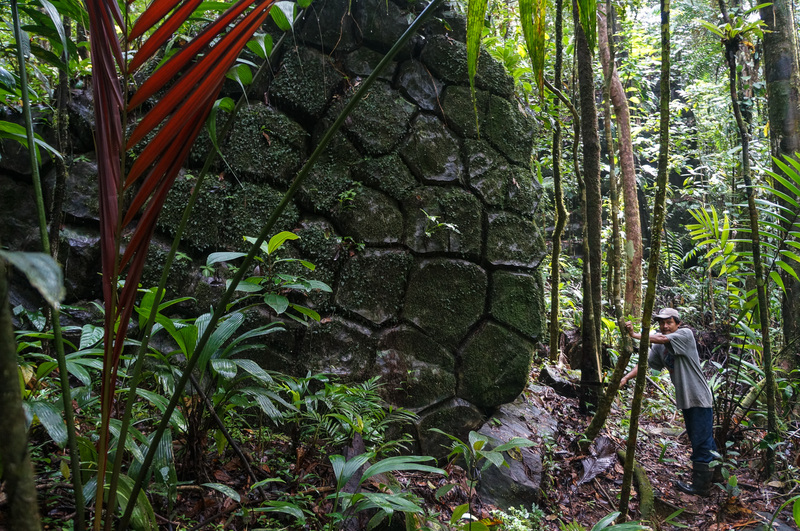 I recently wrote a book review of Douglas Preston´s, Lost City Of The Monkey God, a book about some old structures found in the Rio Platano drainage north of the Coco River. Again, moe humbug. If the columnar basalt were a real big ruin, there would be a detailed archaeology project in operation. 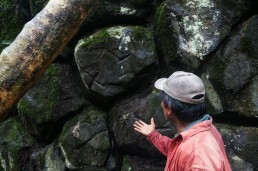 Columnar basalt is formed when the basalt cools down and forms columns. Devil´s Tower in Wyoming is an other good example. Just beware of legends of lost cities until someone can tell you there is more than piles of columnar basalt and has some identificable things like potsherds, artifacts. etc. And you have to keep in mined there is a complete law of National Patrimony that covers these matters to protect them from grave looters. Lastly, be careful. It is one of the places where there really are bad snakes, and a nasty disease called leishmaniasis. Please google that disease before you get enthusiastic about strolling through the jungle. The natives call it lepra de monte and it can kill you and the remedy can be as bad as the disease. Several of the folks in Honduras got leish, including the mucosal variety that destroys the face. That is the interesting part of Preston´s book. I understand that the Canta Gallo basalt rock formations are not human-made and that there is no evidence of pyramids — did you find any scientific studies on them in your research? Hi Joshua! Like I state pretty clearly at the end of this article, the stone formations are columnar basalt, made by volcanic lava flow millions of years ago. What matters, though, is that the Rama have been using them as their sacred site and the stone pyramids have carvings. At the time of our visit, someone was making an archaeological study for the University of Bluefields, but unfortunately, I have no further information on it. When we wrote the article, according to the Rama people, there were no scientific studies available. I’d encourage people to visit Indio Maiz and Canta Gallo for their beauty alone, to meet and interact with the Rama people and get to know their history and stories – from them, not from any books. But if anyone has any studies on Canta Gallo, please let us know, we will be happy to update the article and share the knowledge! Hi there! There’s subscription form in the footer of every page but I just sent you an email with a link, too. Welcome aboard! Hello Jessica! Thanks for stumbling upon us. I’ve just sent you the contact info and further details. Sorry for the delay, we returned from Kenya yesterday. Hopefully we weren’t too late! Hello Stephane! I just sent you an email with all the needed information. Enjoy the adventure! 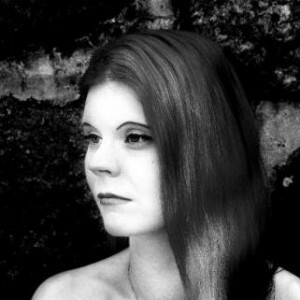 Hi Niina, thank you for sharing your experiences. We will try to do the same trip as you this december. Could you provide us with the contact information of your guide Salomon and that of the Hostal Familiar? Thanks a lot in advance! Hello! Sorry for my belated answer; we were touring Zambia for couple of weeks with limited internet access. I just sent you an email with all the needed contact infos. Enjoy your adventure to Indio Maíz! We would love to hear about it later!  Hi Niina, thanks for the great article. Would you send me Salomon’s contact information via email? I’m very interested in doing a trip with him into the reserve. If possible I’d also like to spend a bit more time inside than one night, maybe 3 or 4, with the hope of talking to some of the Rama who still live there. Best and thanks in advance! Hello Charles! I’ll send you an email with further information. It’s definitely possible to stay longer in Indio Maíz and Salomon would love it as well. You’ll be staying in Rama houses with the families, so you’ll have plenty of time to discuss with them. Have a memorable trip and please tell us about your experience! I thought I had posted a request a few days ago, but didn’t receive a response and now notice it’s not up either….wondering if it ever went through? I want you to know that I am following your suggestion of researching this location. I am an anthropologist returning to get my archaeology Phd but have struggled with “the right place” to do research and have spent endless nights trying to figure this out. As it turns out, what a better project to put my next few years worth of research into! Post finding this article, I have made arrangements to fly in next week (I am half Nica, Canadian, American born) and make it to the site in order to take my own set of pictures and notes; hoping to complete applications and submit right away for approval, funding, permits, guidance etc. I would love to maintain a relationship with you as well update you and your followers with the coming trips. If anyone else has info they can share with me, it would be greatly appreciated. Hi Xochilt! We were away few days, sorry for the delay. I’m so glad you are heading to Canta Gallo and will research the area! Sounds just brilliant, as there doesn’t seem to be any scientific research available. 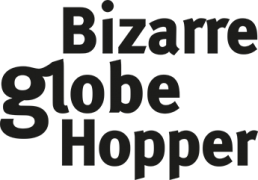 You can contact me though niina@bizarreglobehopper.com, please just send me your further questions. I can also send you our guide’s contants. It would be spendid to hear how your trip went and get some updates from you to our blog! Hi Niina, Please email me. I too am planning a trip in the next 2 weeks in the region and would like to ask you some questions beforehand if you can help. Hi Adrian! I’m happy to help. I’ll send you Salomon’s phone number and hope you’ll reach him. Enjoy your adventure, Nicaragua is a blast! First thank you for your report! Wondered if you would pass on the contact info for your great guide to canta gallo? Heading there last week of March for a two week excursion in the area and would like to spend some time searching for ruins. Thanks again for any info. Hi Todd! Thanks for stopping by. Sure, I’ll send you Salomon’s phone number via email. If you have more time than we did, it might be a good idea to spend more days in Indio Maíz, and after exploring Canta Gallo head even further up river. Enjoy your trip! We are all set to stay with Martha Thursday night and depart with Salomon on Friday for Canto Gallo! Thank you for the information, I will definitely let you know how our trip went. Hi Joanna! Well, that’s nice to hear! Please say hello to Salomon and his son Norvin from us (Niina&Piritta from Finland). I’m sure you will love it, enjoy the jungle! We are all set to stay with Martha Thursday night and depart with Salomon on Friday for Canto Gallo! Thank you for the information, I will definitely know how our trip went. Nina, Thank you for this great article. My boyfriend and I have booked tickets to SJN in February, but is by far, the most information I have found on arranging a trip to Canta Gallo. Would you be able to provide contact info for your lodging in SJN as well as contact info for your guide? I would love to follow the same itinerary you outlined here. Thanks again, and keep up the great blogging !! Hi Joanna! Thanks for your comment. We’ll email you the numbers of Salomon and Hospedaje Como En Familia. Just keep in mind that lodges in SJN give your room eagerly away, if they’ll accidentally get a better deal. Hospedaje did that to us for the second part of our reservation. 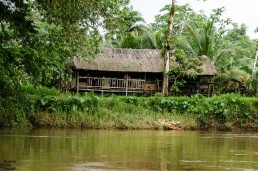 I would still recommend them, since their rooms were quite clean and nicely located on the stilts above the river. Be sure to ask for a river front room, and a lift from the airport as well. Food was very good in SJN standards and the view is the best. Enjoy your trip! We’d love to hear how it went! Hello 🙂 Would you please send the guide’s phone number to me? Hi Elena! I just sent you Salomon’s number, I hope you’ll reach him. Enjoy your adventure! We miss Nicaragua already. Hello! I am visiting Nicaragua in December 2014/January 2015 and will be based in Managua. I have emailed a couple tour companies about trips to Indio Maiz but I have not been too satisfied with the proposed itineraries. Your adventure sounds marvelous! Did you go through a tour company to find your guides and plan the trip? Could you make some suggestions? Hello Jennifer, thanks for stopping by! Actually I wouldn’t recommend a tour company, because you can easily fly to San Juan de Nicaragua (Greytown, SJN) from Managua and hire a guide from there. Don’t compromise, approve only Rama Indians as your guide to be fully immersed in their unique culture. Then you’ll be sleeping in a real Rama Indian home instead of a tent which is the usual deal with other guides. Also the profits will go to the community. I can send you a private message including more info and our guide’s phone number, so you could negotiate your SJN-Indio Maíz trip with him beforehand. 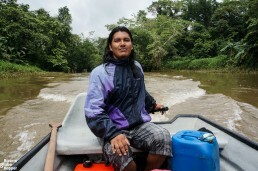 Salomon is a really nice guy, and he can do the trip just the way you’d like to. Most Ramas take tourists only to the village of Makenge, but he’ll take you much further to see a quieter side of the Rama Indian life. This will make your experience more authentic. If you decide to go with him, I’d have a small favor to ask 😉 We destroyed his beloved bird book and promised to send him a new one, but it’s not possible to send post to SJN. We could send the book to you, if you could just bring it all the way to those remote lands. Just drop us a line, if you are interested. Hi Niina! Beautiful photography! Looks like an incredible adventure. I’ve added it to my bucket list as one of the many reasons to return to Nicaragua! Hello John! Thanks. We also fell in love with the country and hope to return there some day. Happy travels to you and Heather! Thank you Agustin! Canta Gallo sure is worth the long trip, I’m sure you’ll love it. Please say hi to Margarito and Javier for us, if you happen to see them. Enjoy your expedition! sorprendente había oído hablar acerca de esto como cuento ,pero nadie había mostrado algo creíble como su reportaje lo cual le da un valor enorme ojala y se conserve como patrimonio mundial y que se puedan hacer estudios científicos serios. Muchas gracias, MITO! No soy segura si comprendo todo, pero Canta Gallo es un lucar magnífico! If someone of you knows that there’s any studies available, please keep us updated. It’s been great to share our thoughts with you, thanks for sharing the article. I really hope Canta Gallo (and Indio Maíz in general) will get the appreciation it deserves. 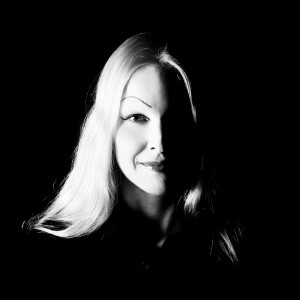 Dear Niina, I truly enjoyed your article. Thank you so much for sharing. I’ve found my next adventure. I’ve gone to the Indio-Maiz through the Rio San Juan side, and it’s truly paradise. FYI, I’ve been working on setting up an ecolodge in the El Castillo area and hope to have Sacuanjoche available next year as another base location from which to explore the great Indio-Maiz. Please checkout our Facebook page in case you’re interested. Dear Guillermo! Thank you so much, I totally agree with you, Indio Maíz is such an amazing place both in terms of nature and cultural heritage. All the best to your new business. Greeting from already wintery Finland! Dear Nina, im grateful you comment about the reserve indi maiz and specially the ruins which I did not know exist, im in Nicaragua I live in Eastbourne England, I ll like to keep in touch with you as I love the archeologic sites in Nic. and in the rest of Americas, thanks for publish this article about my country and the people I love the natives Nicaraguas, like ramas, sumos and miskitos best wishes. Dear Lesvia Maria, thank you so much for your kind comment. We felt so grateful for our brief visit in Indio Maíz and would love to return some day. 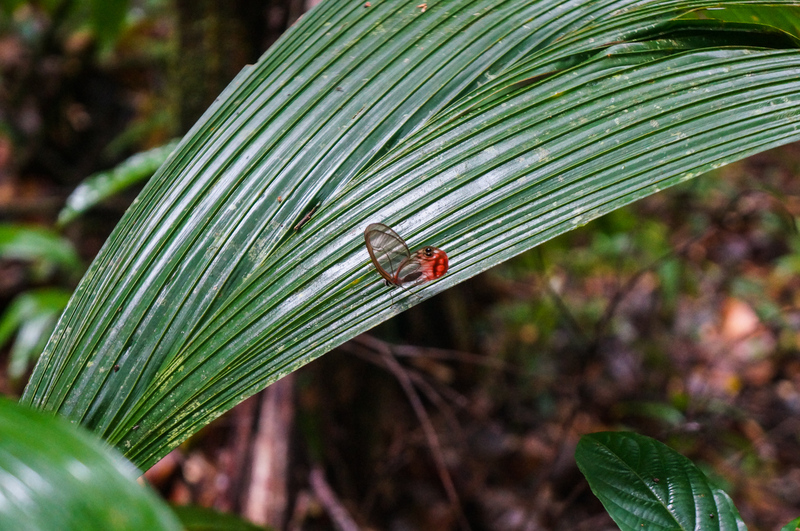 If you are interested, we are planning to write a separate post about Ramas and our visit in the Reserve. We spent one month touring the country and will feature later on also several other places like Corn Islands, Ometepe (petroglyphs), and Somoto Canyon. I feel the urge to explore the Caribbean coast (incl. Miskito and Pearl Keys), but it will be a new adventure, hopefully soon! Bosawás is on the top of our list as well. We fell in love with your beautiful country! You can find us also in Facebook, Twitter and Instagram, let’s connect. All the best, Niina. 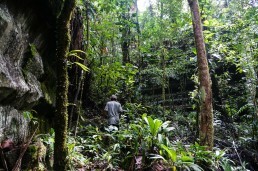 I have spent 20 years in the Indio Maiz National Park. I have many Rama Indians that I call friends and they call me Osito. It is truly a special place and I doubt there is any person who has seen the whole Reserve. It is rugged and unforgiving even for me. 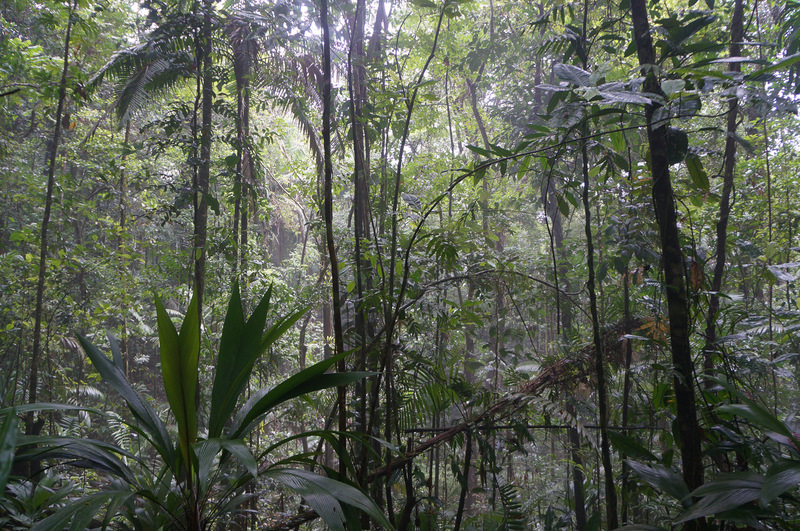 I spent 30 years in the military and have been in every jungle on this planet on various missions and this place is the best I’ve experienced. A VERY special place. Hi Mike! Thanks for stopping by. I really appreciate your comment. We saw just a little glimpse of that vast and mysterious Reserve, but felt extremely thankful for it. I really would like to return there someday. Visiting Indio-Maíz remains one of those experiences that I’ll cherish the rest of my life. Greetings from Finland! Sounds like a fascinating place Niina. Definitely off the beaten track. If I even make it to Nicaragua, I will make sure to check it out. Thank you Andrew, it sure is a magical place. Spending a couple of days off the grid with Rama Indians was one of the highlights of our trip. We’re going to write one more post about our Indio Maíz adventure in upcoming weeks including some further information of Ramas and their culture. There are only 2000 Rama Indians left and they are on the verge of losing their native language.